Markets got a strong boost from a bullish API report published yesterday, which propelled prices higher overnight and this morning. Crude prices gained 30 cents yesterday to close at $54.38. 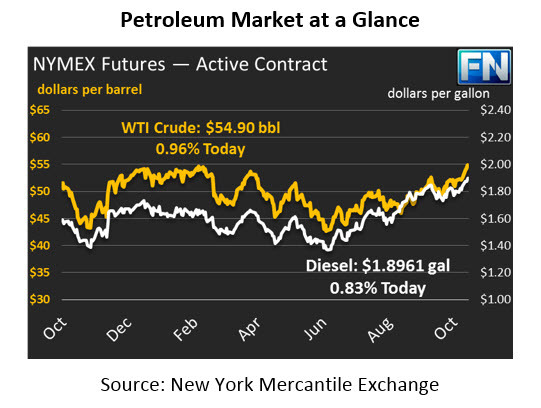 This morning, crude is continuing to strengthen, gaining another 52 cents (.96%) to bring prices to $54.90. Diesel remained mostly flat during yesterday’s trading session, closing at $1.8845, just 53 points above its opening. This morning, diesel has gained 1.56 cents (.83%) and is currently $1.8961. Gasoline also saw prices move higher, with 1.97 cents (1.14%) gain, bringing prices to $1.7522 this morning. The API’s inventory report is supporting markets this morning, showing larger-than-expected draws across the board. The trade will be watching to see if the EIA confirms the data. If it does, the combined crude and product draw of 15.9mmbbls will be the largest combined draw in the last 8 years. 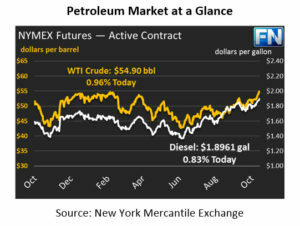 Markets also received support from an increase in OPEC production compliance. A Reuters study estimates that oil outputs fell by 80,000b/d, putting compliance for the month of October at 92%, up from September’s 86%. However, a large portion of the production decrease is due to Iraq, where outages in the northern oil fields after Kurdish clashes resulted in a 120kbpd production cut. Nonetheless, markets were strengthened by the increase in compliance as it is perceived by many analysts as a sign of a rebalancing global market.